Why do I have to use optical modeling? 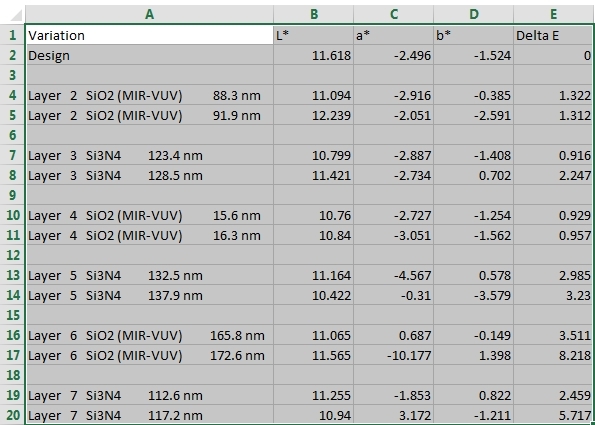 Optical modeling is a very clean and transparent way of analyzing measured optical spectra. If the model is done in a good way it has exactly the parameters that you want to know, such as film thicknesses, band gaps, amounts of impurities or carrier concentrations. Up to now the traverse analysis program bright_eye_traverse.exe required for all products the number of analyzed spectra (i.e. the number of probeheads) to be the same. This restriction has been removed. If an incoming scan file (which holds all measured data) has more spectra than the selected product, the excess data are simply ignored. Under some circumstances the inline analysis program bright_eye_inline.exe would suddenly stop to process new files. The only way to go on with data analysis was a manual re-start of the program. This bug has been removed. If you would like to check what color difference a thickness change of a layer in a stack may cause you can do that quite easily with a new feature of ‘color fluctuation’ objects. These integral quantities compute, for thickness fluctuations defined in the layer stack, the size of the ‘color cloud’ that you can expect when producing the stack many times.